The Israeli government and many of its U.S. supporters tried everything they could to defeat President Obama’s nuclear deal with Iran. Fortunately, they failed and peace and diplomacy won! But now Congress and the Obama administration plan to reward Israel by authorizing the transfer of “massive ordnance penetrators” and other advanced weaponry that it can use to attack Iran. If Israel bombs Iran, then there’s a good chance that the U.S. will be dragged into another war. And the U.S. is prepared to sign a new 10-year deal to give Israel—one of the largest weapons exporters in the world—as much as $45 billion more in U.S. taxpayer-funded weapons. Israel routinely uses these weapons to injure and kill Palestinian civilians and destroy their homes, agriculture and infrastructure, in violation of U.S. law. We just avoided a potential war with Iran. Why would we now give Israel weapons it needs to start a war with Iran and more weapons to continue oppressing the Palestinians? 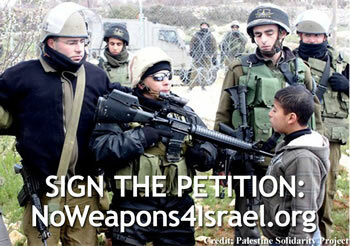 Sign the petition to President Obama and tell him #NoWeapons4Israel. The United States should not reward Israel with more weapons after Israel and its lobby, AIPAC, attempted to scuttle your administration’s nuclear deal with Iran. The transfer of “massive ordnance penetrators” and other advanced weaponry increases the likelihood of a unilateral Israeli attack against Iran. And a new 10-year deal to provide Israel with up to $45 billion in more US taxpayer-funded weapons will deepen US complicity in Israel’s human rights abuses of Palestinians, in violation of the Arms Export Control and Foreign Assistance Acts. We just avoided a potential war with Iran. Do not give Israel weapons that it can use to start a war with Iran and more weapons to continue oppressing the Palestinians. 65460 2.5 years ago Frank Walter Portland, OR , US All this occurred in 2015, and nothing has changed: Israel rules! President Obama, we want our country back; you can give it to us. 65456 2.6 years ago Aurora Marquez santa barbara, CA , US peace is what is needed. 65455 2.6 years ago Frigga Karl paris, ot , FR Israel is a rough state, weapons in the hands of a rough state are dangerous for humanity. A rough state does not apply to the rules of a civilized nation. 65450 2.6 years ago Eleanor Muldoon Pocasset, MA , US It's not right and we can't afford it. The current Israeli govt. is not a friend of the USA. 65439 2.6 years ago Stephen Brackens Brinkley San Diego, CA , US FELLOW AMERICANS GENOCIDE IS BEING COMMITTED IN OUR NAME! STOP THE BARBARISM! We appreciate your enthusiasm but please do not sign more than once, as we're trying to keep a count of unique signers and have to go through and remove duplicates. Instead you can really help by asking other people to sign. This petition is sponsored by WarIsACrime.org, World Beyond War, Code Pink, American-Arab Anti-Discrimination Committee, Jewish Voice for Peace, U.S. Campaign to End the Israeli Occupation, RootsAction.org, American Muslims for Palestine, Defense for Children International Palestine, Middle East Children's Alliance, and U.S. Palestinian Community Network. You may receive action alerts from one or more of these organizations.